Are you GDPR ready? eHealth Hub presents Practical Steps to Data Protection Compliance. 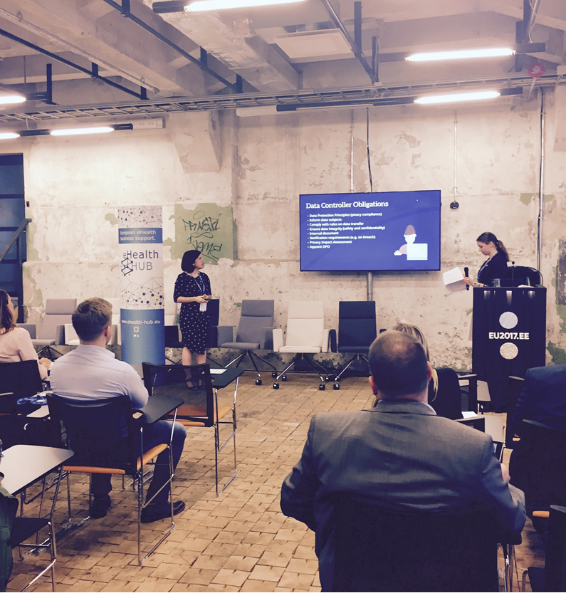 eHealth Hub is a partner to eHealth Tallinn 2017, a European conference dedicated to Health in the Digital Society, which took place from the 16th to 18th of October 2017. The event was attended by many high-profile government officials from Estonia, Finland, Latvia, Sweden and the Netherlands, and Kersti Kaljulaid, the President of Estonia, Mr. Xavier Prats Monné, Director-General of the European Commission, Vytenis Andriukaitis, Commissioner for Health & Food Safety, European Commission, as well as executives from the industry such as Gilles Litman, VP of Sanofi, Henrique Martins, Chairman of the Board Digital Europe (Portugal), Laurance Stuntz, Director of Massachussets eHealth Institute (US). The session was introduced by Clemence Tanzi (Queen Mary University of London) who gave an overview of the EU-funded project eHealth Hub and the support provided to SMEs and major actors in eHealth. 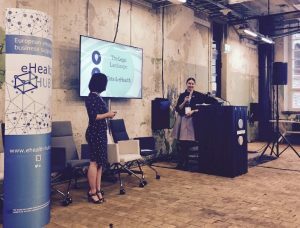 She was joined by Charlotte Lavery (Queen Mary University of London) and Siiri Kuusik (Njord Law Firm, Estonia), who is also a legal node for the eHealth Hub network. The team presented an interactive session on the new online data and privacy landscape. They explored how European data protection laws impact the collection and processing of data and its implications for companies. Businesses and entrepreneurs received a detailed understanding of how to adhere to data protection standards whilst maintaining their commercial goals. What entrepreneurs should be doing to protect current or potential businesses. What is the GDPR response to data transfer outside the EU? What will the implementation of the new regulation mean for countries that already have higher levels of protection requirements? Does the GDPR leave any flexibility for countries to implement its new requirements? As a business, where do you draw the line in identifying sensitive data in a health context? For example: would collecting how many cups of water a user drinks each day be considered sensitive personal data? The audience engagement and feedback emphasised the relevance of the topic to businesses and entrepreneurs in the upcoming months.